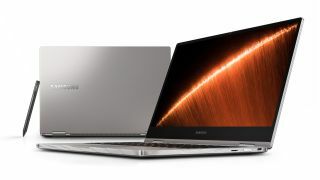 Samsung has revealed a refreshed Notebook 9 Pro over at CES 2019, plus the PC vendor launched the Notebook Flash which will be available imminently in the US. Just like its predecessor, the new Notebook 9 Pro is a sleek and slim 2-in-1 featuring a stylish design – with a metal construction and diamond-cut edges – yet it still offers plenty in the performance stakes. In this refresh it gains an 8th-gen Intel Core i7-8565U quad-core (eight-thread) processor with a base clock of 1.8GHz, which is capable of turbo up to 4.6GHz when the chip needs to stretch its legs. That’s backed with 8GB of system RAM, and a 256GB PCIe NVMe SSD (plus integrated graphics – Intel UHD 620 to be precise). The 13.3-inch model runs with a Full HD display and has seen the screen bezel slimmed down to 6.7mm, and the backlit keyboard has been ‘comprehensively redesigned’, Samsung notes (although we already felt it was spacious and comfy in the existing model). Samsung is promising up to 14 hours of battery life, although it doesn’t qualify that figure with any details on the usage type (presumably light use). You get fast charging, as well. Furthermore, buyers benefit from a pair of 1.5W stereo speakers which have Thunder Amp technology that ensures the volume can get pretty loud (relative to the speaker size, at least). Connectivity includes a pair of Thunderbolt 3 ports, a USB Type-C connector, and a microSD slot. The Samsung Notebook 9 Pro (which comes with an Active Pen boasting 4,000 levels of pressure sensitivity) is expected to emerge early in 2019, with the price still to be confirmed. Samsung was also showing off the Notebook Flash at CES, and announced that this affordable laptop will be launching in the US on January 15. It will be available direct from Samsung and Amazon with a starting price of $349.99 (around £275, AU$490) in charcoal color only. Launched in Asia last year, the Notebook Flash runs with an Intel Celeron N4000 processor, or you can fork out $399.99 (around £315, AU$560) for the model which steps up to an Intel Pentium Silver N5000 CPU. Both flavors are equipped with 4GB of memory, 64GB of eMMC storage, 802.11ac 2x2 Wi-Fi and a 13.3-inch Full HD anti-glare display. The claimed battery life is up to 10 hours according to Samsung, and connectivity includes a pair of USB Type-C ports, two further USB connectors (3.0 and 2.0) plus a microSD slot. The Notebook Flash has a fingerprint scanner, and a retro typewriter-style keyboard design both of which differentiate it from your run-of-the-mill budget notebook. Note that Samsung has also revealed the Notebook Odyssey gaming laptop at CES, which we’ve already covered.